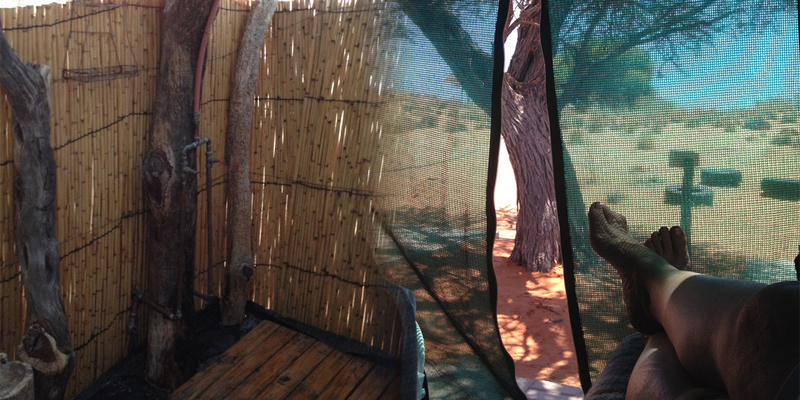 Beautiful self catering chalets in the Kalahari near Koës, Namibia. A place to unwind, relax, breathe and be inspired by nature. Read a review by well known photojournalist, Stephen Cunliffe here. Enchanting place, we will always remember it and your wonderful hospitality – GRAZIE! Wat een geweldige plaats hier! Je bent deel van de natuur, in de stilte met de schepping één geheel. Prachtig en heerlyk genieten! Where elegance and ecology come together -from people who understand their dimension and want to transmit these values to receptive souls. Wat ‘n lieflike plek! Netjies, stylvol, elegant! So lekker hier gebly – lekker gebraai, te veel van die heerlike brood geëet! Alles wat ons nodig gehad het, was hier. Vreeslik dankie, ons kom beslis weer sommer vir ‘n paar dae. Rus vir die siel. Geestelike batterye word herlaai en die beste verblyf wat ons nog gedurende ons toer gehad het. Baie dankie vir die gasvryheid en lekker gesels. Ek hoop dat ons spoedig of “eendag” weer hier kan kuier. Mag julle net seën ontvang op alles wat julle aanpak. What an incredible place…….the attention to detail is amazing, the nature beautiful and Kalahari dunes rejuvenate your soul. Thanks for your hospitality and delicious braai chops! We welcome you to be inspired by nature, to unwind and relax and to explore the beautiful surroundings. Come on, take a breather! Clear sky. 21°C at 00:00. Gentle breeze, 5 m/s from southeast. No precipitation expected between 00 and 06. Clear sky. 16°C at 06:00. Light breeze, 3 m/s from south. No precipitation expected between 06 and 12.